Every Friday I like to post a photo that I took that week that makes me happy. And they are usually those technically imperfect snapshots. ;-) I would love if you could link your own "makes me happy when I look at it" photo in the comments on this post. Forgive me for asking, but I'm trying to figure out what the actual photo is of? I've been staring at it, trying to figure it out, but I'm stumped! This is my "makes me happy" post because I hardly ever capture my own children with my camera. Thanks for sharing yours and encouraging others to do the same! 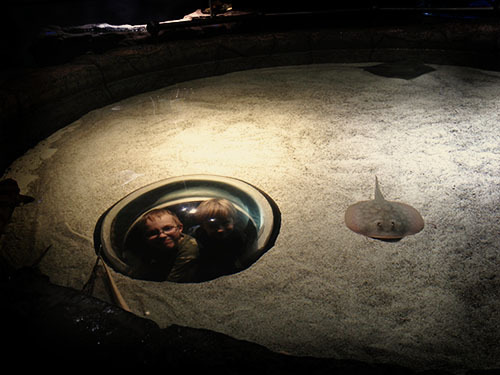 And Anonymous, that is a photo of the boys under a plastic bubble in a sting ray tank. Crazy, right! mL, thank you so much for nominating me! Wow! And Bev, love love love your image. So touching and beautiful. It makes me happy too. Here is my "makes me happy" it's not technical or even part of my portfolio. It's my daughter (Who makes me happy everyday) doing what makes her happy, collecting rocks. And I chuckle because when I went to wash that vest, it had a bunch of rocks in the pockets. I couldn't figure out what it is either but no matter, I think it's a beautiful shot.